Thank you for featuring our sports clinic last May-June, 2016! MANILA, Philippines – Part of the 1990 Millennium Development Goals (MDGs) of the Philippines was to significantly decrease the percentage of underweight children in the country from 27 percent to 13.5 percent by 2015. Although progress has been made in this regard, efforts have still fallen short. In 2015, the percentage of underweight children under age 5 was still at 20 percent. With this situation in mind, the idea for The MEALenium Project was born. Founded by two teenagers, Joshua Emmanuel Tan and Philip Sebastian “Basti” Belmonte, in partnership with Fr. Julio Cuesta, the parish priest of St. Benedict church, and the Payatas Orion Foundation (PAOFI), the MEALenium Project aimed to provide nourishment to the impoverished young babies and children of St. Benedict, Payatas. In addition to the nutritional provision, Joshua and Basti – who are both varsity athletes – also wanted to focus on promoting the children’s physical and social development. While on their summer break from school, the teenagers developed a sports clinic program that focused on their respective fortes — table tennis for Joshua, basketball for Basti. With the help of the PAOFI social workers, and in cooperation with table tennis coaches Mario and Michael Breiva, and basketball coaches Nixon Distrito, Allan Marticio, and Darwin Marron, the MEALenium Project Sports Clinic was launched. For four Saturdays this summer, children ages 9 to 15 from the Payatas community came together to learn new sports skills, engage in healthy competition, and simply have fun! The activity culminated with a finals match and recognition was given to the winning participants. 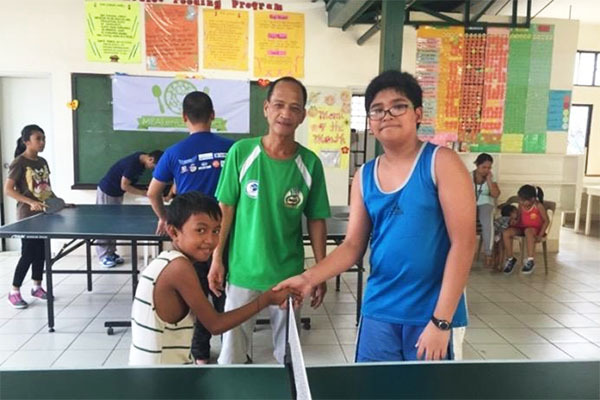 The table tennis champion is the little boy in the photo, 11-year-old James Esmeria. Though somewhat small for his age, this young athlete was agile enough to beat his opponents fair and square. He attends Melencio Castello Elementary School regularly even though food at home has been scarce. He is currently one of the children in the feeding program. Fortunately, his mom recently found work as a household helper and with her salary, his family can buy more food. They only get to see her once a month and it is his grandmother who takes care of him and his four siblings. Allen Kerby P. Lloren, on the right, is the runner-up in the table tennis tournament. He is 12 years old and shares a house with 22 family members. He joined table tennis because he wanted to try something new. A math whiz, Allen will begin attending Philippine Science High School this August. His mother first taught him math when he was four years old. His grandmother is a high school teacher. Allen appreciated the sports clinic because he saw that it promoted exercise, taught them sportsmanship and helped them forge new friendships in the community. This summer’s Mythical Five are Kelvincent Bodoso – MVP, Ronald Aguirre, Christian Ferrer, Aldy Pimero and John Carl Espinoza. MVP Kelvincent Bodoso is a quiet 12-year-old who studies at Melencio Elementary School. He found out about the sports clinic from a church announcement. He hopes to join his school’s varsity basketball team and dreams of one day becoming an engineer. He says that not only did the sports clinic teach him new dribbling and shooting skills, he also learned about discipline and the need to practice daily to improve himself. His father is an electrician and his mom is a security guard. Ronald Aguirre, 14 years old, is another Mythical 5 awardee who dreams of one day becoming a PBA player. Aside from having enjoyed the basketball clinic so much, Ronald said that he learned new skills and sportsmanship. Having gained new friends through the games, he wanted to know if another basketball clinic would be held in the future. Another one of the basketball clinic participants was Juanito Caser III. This 13-year-old has been a scholar of Payatas Orione Foundation for the past three years and is currently a Grade 8 student in Batasan High School. He was a varsity player in his previous school but was unable to try out after he transferred. He is now motivated to go to tryouts this year. He sees basketball as a way to “iwas rambol rambol” (“avoid trouble”), because it does not matter if they are on different teams during the game, they remain friends once the game is done. Juanito dreams of one day joining the PBA or becoming a soldier through the Philippine Military Academy, as he wants to help protect the country. His father is a bus driver and his mom is a housewife. The MEALenium Project also has the privilege of working with college students who have been inspired to collaborate with the program. Volunteers from De la Salle University, Mapua Institute of Technology, Taguig University, University of Rizal System and Waldorf Institute have given time to the children, teaching them academic skills and getting them ready for kindergarten. The MEALenium Project started with the main goal of providing nutritional sustenance to the needy children of St. Benedict, Payatas. Since then, it has expanded its program to also include activities that facilitate the development of the children’s cognitive skills, academic learning, sports skills and social skills. Next month, the MEALenium Project celebrates its first year anniversary, and it indeed has much to be thankful for. It celebrates the growth of this worthwhile endeavor and the advocacy that continues; it celebrates the opportunity to work in partnership with different organizations and individuals with a deep commitment to service; and, it celebrates a poignant realization that when people come together to serve, uplift, and support one another, a small idea from two inspired teenagers can quickly grow into so much more.